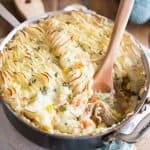 This Chicken Cottage Pie is a bit of a cross between 2 great classics: Chicken Pot Pie and Cottage Pie. 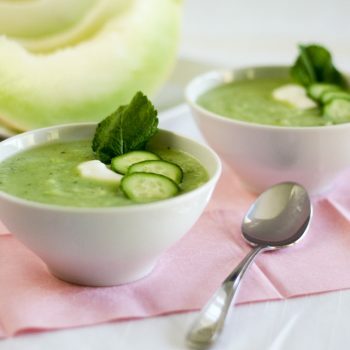 With such a winning combination, you simply can’t go wrong… the whole family will love it! Why I’d never thought of uniting these 2 before now is totally beyond me! 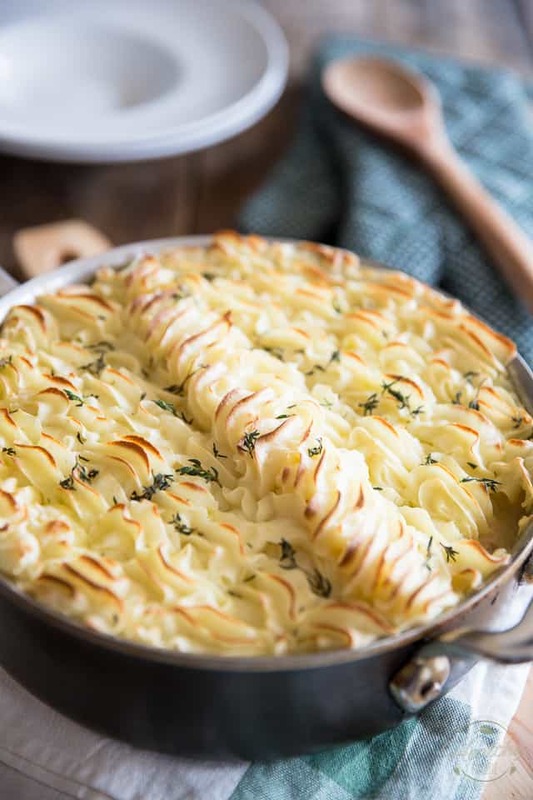 I mean I LOOOOOOVE me a good cottage pie; ever since I can remember, it’s always been one of my favorite comfort foods in the whole wide world, although up until recently, I’d been calling it Shepherd’s Pie, which apparently, is wrong — reprehensibly wrong. Oh well. I might have been giving it the wrong name, but it still tasted very good and felt very nice in my tummy. As for Chicken Pot Pie, I’ve always been a huge fan of it, but can probably count on one hand the number of times that I’ve actually made some at home. 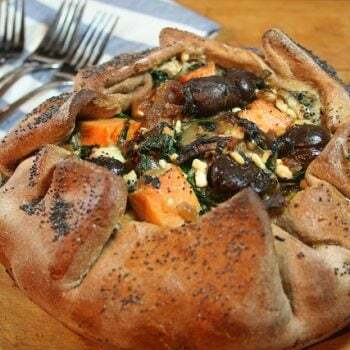 For starters, I can’t be bothered with making the pie crust, a thing which you probably know by now I hate with a passion. Secondly, I find that Chicken Pot Pie tends to be a bit on the indulgent side, mostly because of the aforementioned pie crust. 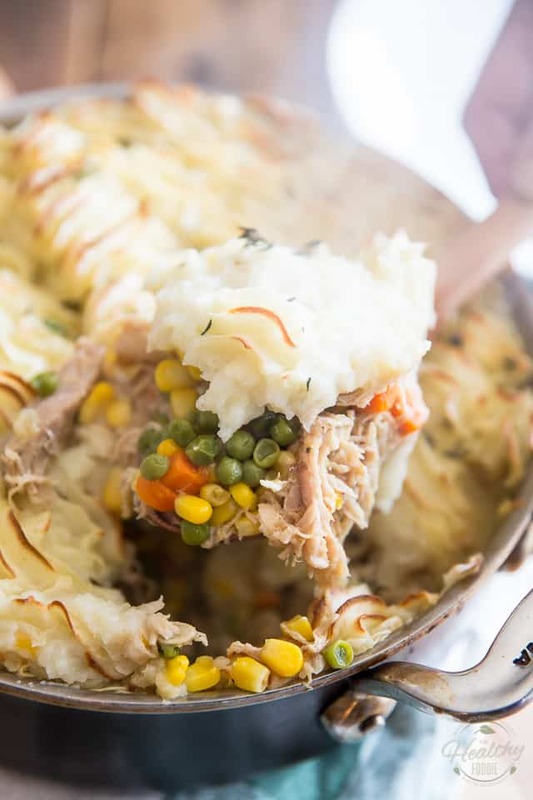 But with this Chicken Cottage Pie, you get the best of both worlds — you get all the great flavor AND major comforting factor that Chicken Pot Pie provides but in a much lighter, healthier version. AND you don’t have to deal with making pie crust! Yeah, that’s me trying to be funny! Key word being trying. 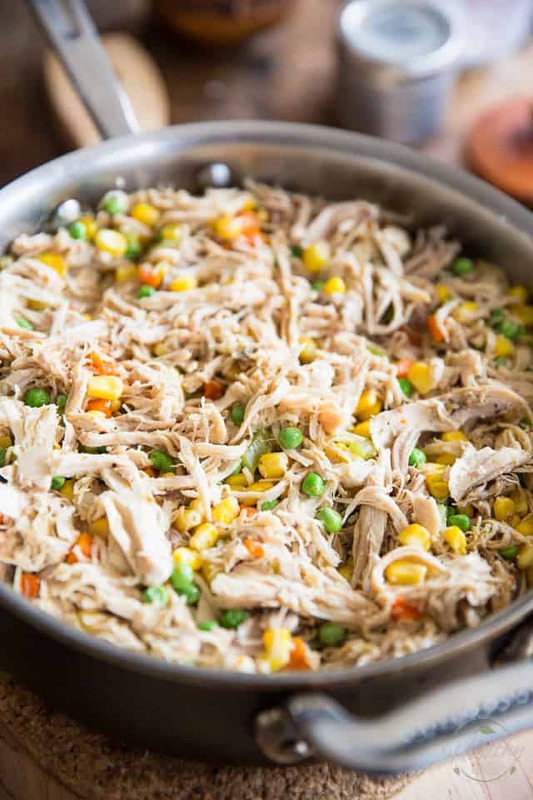 The only little “drawback” with this version, if we can call it that, is that you have to have leftover cooked chicken in the fridge in order to make it. Mind you, this can almost be seen as an advantage sometimes, you know. For instance, leftover TURKEY would work just as well… wink, wink! In this household, though, having access to leftover chicken never really is a problem. Seeing as how I must be making my famous Dutch Oven Roasted Chicken at least 2 to 3 times a month, I practically ALWAYS have leftover cooked chicken as well as bone chicken broth on hand. So yeah… I get the feeling I’ll be making this often, from now on. And once you’ve had a taste of it, you’ll probably do the same! Cook them in salted boiling water and really, don’t be cheap with that salt: your water should be “salted like the sea”. Taste it. Make sure it’s salty enough. 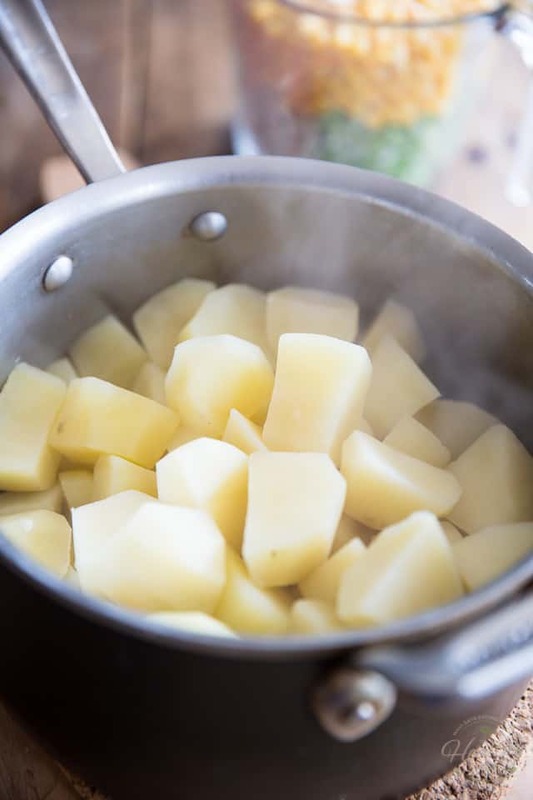 Just like pasta, potatoes absorb salt as they cook — if you don’t add enough salt now, you’ll never be able to recoup for that later, no matter how much you add. And your mashed potatoes will be bland and tasteless. No one likes tasteless mash. So there; add plenty of salt to your water and cook the potatoes until they become really soft and practically fall apart when you poke them with a fork. And since potatoes take a while to cook, we’re not gonna just stand there and watch them boil; we’ll get the rest of the stuff done in the meantime, if that’s alright with you. 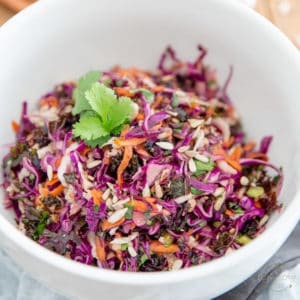 Start by preheating your oven to 375°F and then heat some olive oil in a saute pan set over medium heat; throw in some onions, carrots, celery and garlic and cook until fragrant and slightly softened, about 3 minutes. Next, tear your cooked chicken into longish strips with your fingers, or, chop it up with a knife if you prefer your meat to stay in big chunks. Add the chicken the pan, along with the chicken broth and water; bring that to a low boil, cover, lower the heat and simmer slowly for about 8 to 10 minutes, or until the liquid is practically all gone. 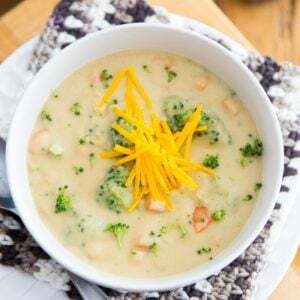 Note that to make this recipe, I used my Dutch Oven Chicken Bone Broth, which is fairly concentrated, so I used 1 cup of chicken broth and 1 cup of water. 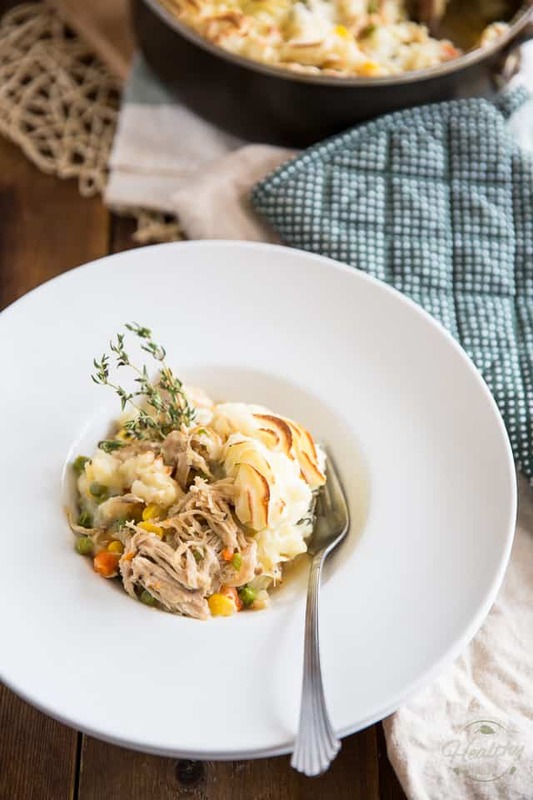 If your chicken broth wasn’t quite as tasty or concentrated, or if you wanted CRAZY intense flavor in your meat layer, you could use all chicken broth instead. Once all the liquid is pretty much gone, throw the frozen peas and corn kernels in the pan. 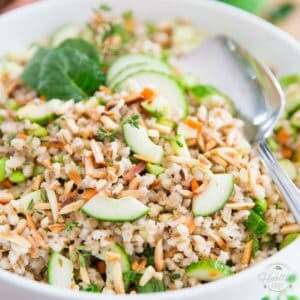 No need to thaw your veggies here… in fact, you DON’T want to thaw them. 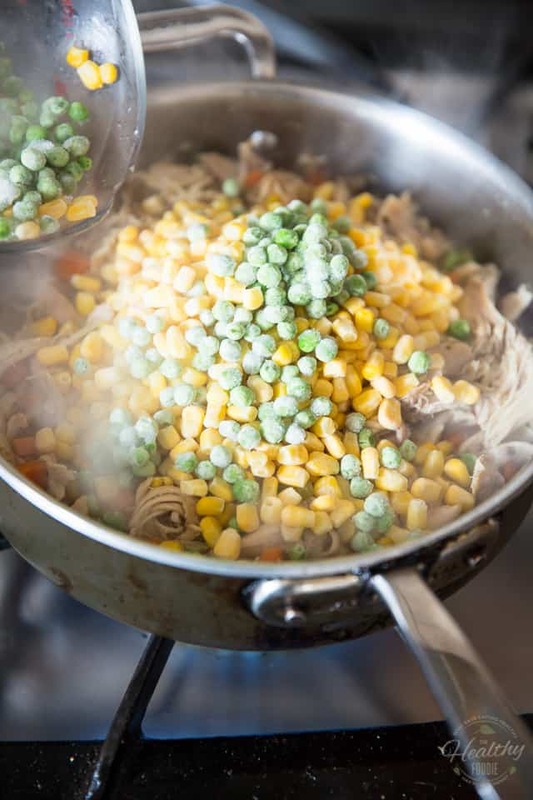 As they cook, the frozen corn and peas will release a little bit of water, which will then turn into a deliciously creamy sauce at the bottom of the pan. More goodness for less work. I’m all for that! Now give everything a good stir and set the pan aside for now. 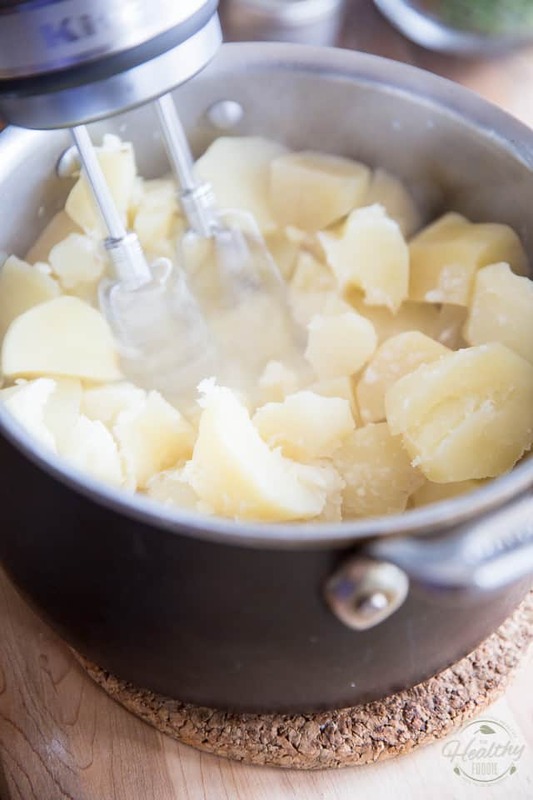 Hopefully your potatoes will be good and cooked by now, so we’ll get busy turning them into a luscious and fluffy puree. When the potatoes are fully cooked (and even slightly overcooked) drain them really well and return them to the saucepan. 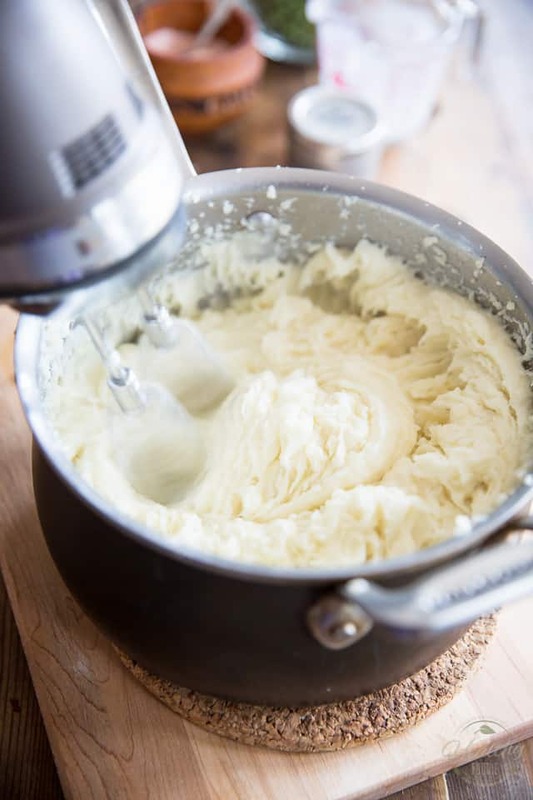 Now about the sour cream… I’m a huge fan of the slight, intriguing little tang that it confers to the mashed potatoes but if you feel it’s not really your thing, feel free to use a few tablespoons of ghee, butter or olive oil instead. 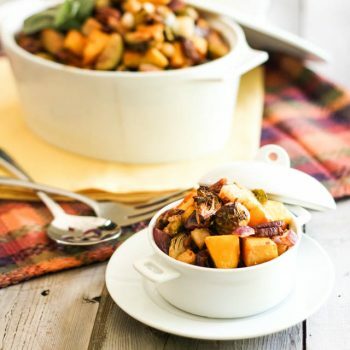 Beat the potatoes with an electric mixer — yes, that’s with an electric mixer. My dad thought me that trick when I was a kid and to me, it’s always been the only way! Try it, you’ll see; you’ll be amazed at how fluffy, creamy and light mashed potatoes can be! Just start on low speed until the potatoes break down a bit and the puree starts to come together, then increase the speed to medium. Progressively add the rest of the milk mixture, a few tablespoons at a time, beating well between each addition, until the puree becomes nice and fluffy. Once your mashed potatoes have reached the desired consistency, adjust seasoning as needed by adding salt and ground white pepper, to taste. Why white pepper? Well, mostly because I don’t really care for tiny black specks in my perfectly white puree and also too, I find that the taste of white pepper goes really well with mashed potatoes. 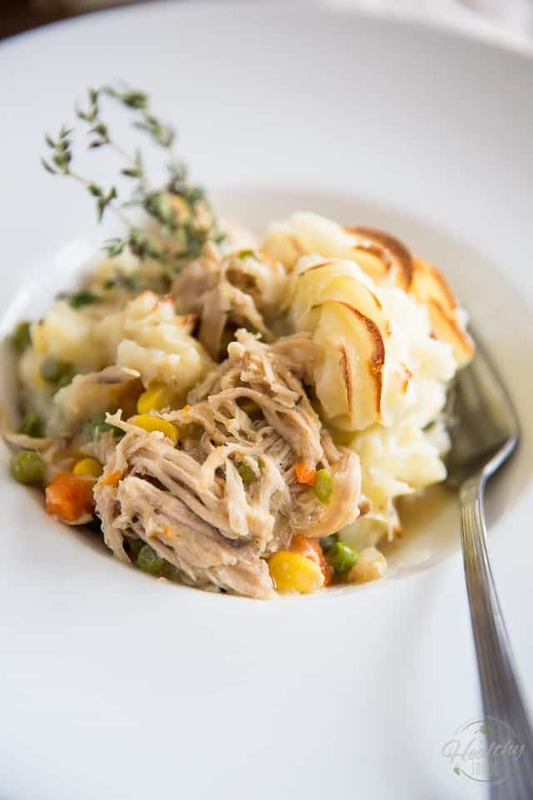 Now spread your mashed potatoes over the reserved chicken mixture; if you wanted to get real fancy about it, you could pipe your potato puree with a pastry bag equipped with a large open star tip. Small effort – big payoff, me thinks! Especially if you happen to have all the necessary gear on hand. Bake your Cottage Pie in a 375°F oven for 30 minutes, then broil it for 3-5 minutes or until the top becomes nice and golden. You can drizzle a little bit of olive oil over the potatoes to help them brown better. When you’re happy with the color of your potatoes, remove the pan from the oven and allow the dish to rest for 5 to 10 minutes before serving. And now there is but one thing left to do: ENJOY! 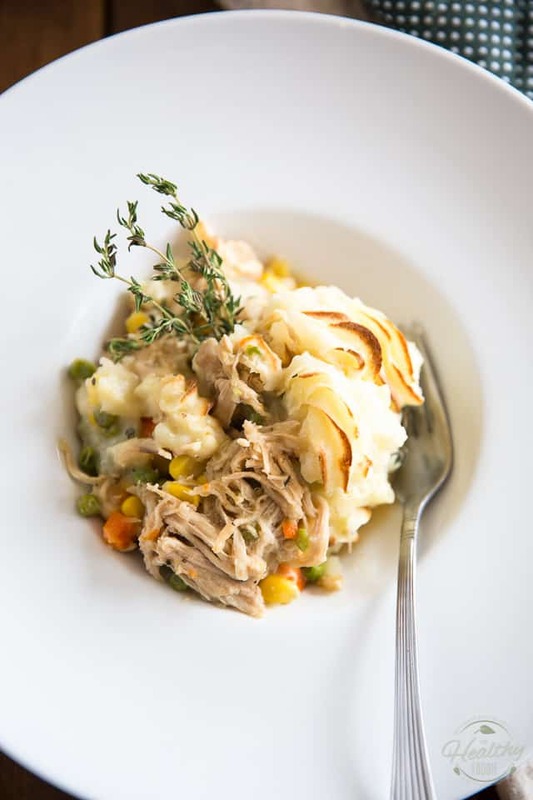 This Chicken Cottage Pie is a bit of a cross between 2 great classics: Chicken Pot Pie and Cottage Pie. With such a winning combination, you simply can't go wrong... the whole family will love it! 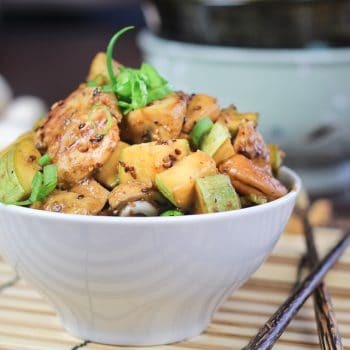 Cook the potatoes in salted boiling water (your water should be "salted like the sea") until they become really soft and practically fall apart when you poke them with a fork. 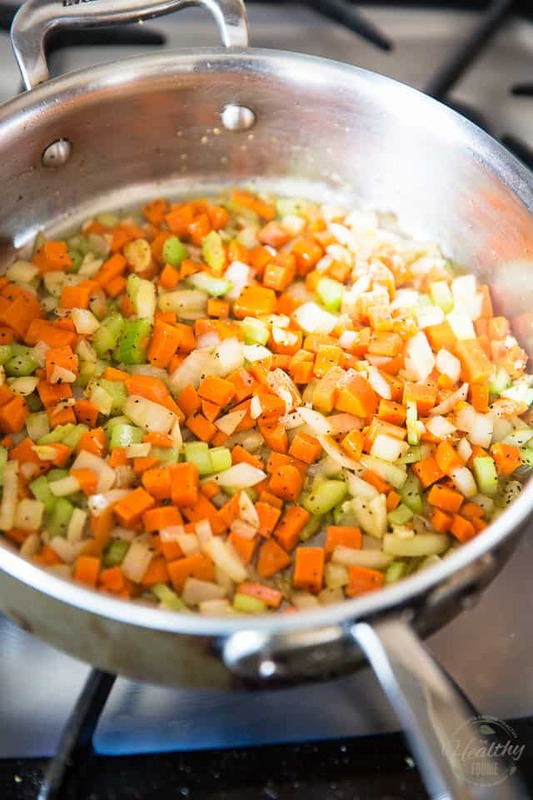 While the potatoes are cooking, heat the olive oil in a saute pan set over medium heat and then throw in the onion, carrots, celery and garlic; cook until fragrant and slightly softened, about 3 minutes. 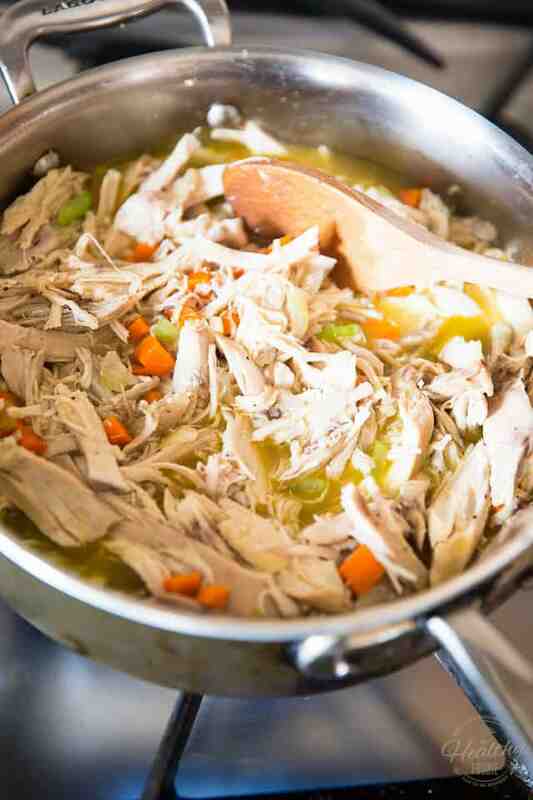 Tear the cooked chicken into strips with your fingers and add it to the pan, along with the chicken broth and water; bring to a low boil, cover, lower the heat and simmer slowly for about 8 to 10 minutes, or until the liquid is practically all gone. Stir in the frozen peas and corn kernels and set aside. When the potatoes are cooked, drain them well and return them to the saucepan. 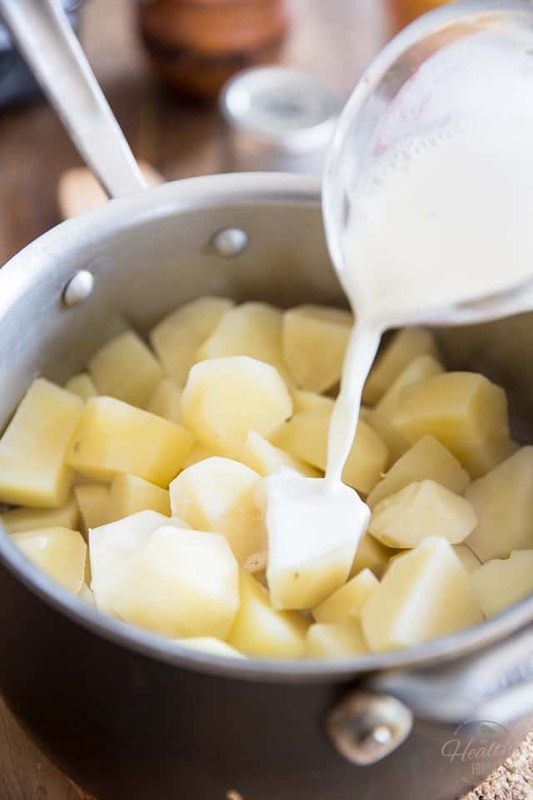 Whisk the milk and sour cream together in a small measuring cup and pour about half of this mixture over the potatoes. Beat with an electric mixer on low speed until the potatoes break down and the puree starts to come together, then increase the speed to medium. Add the rest of the milk mixture, a few tablespoons at a time, mixing well between each addition, until the puree becomes nice and fluffy. Adjust seasoning as needed by adding salt and white pepper, to taste. Bake in a 375°F oven for 30 minutes, then broil for 3-5 minutes, or until the top becomes nice and golden (you can drizzle a little bit of olive oil over the potatoes to help them brown better). I have never heard of a cottage pie. I have sheperd’s and chicken pot pie but not cottage. I always said if I want to eat crust I want it in a pie or cobbler. HA!! I actually prefer most pies to be crustless. Cobbler is my favorite. Love this idea! 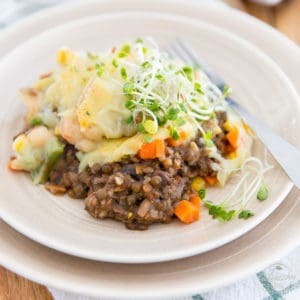 I am also guilty of calling it Shepherd’s Pie rather than Cottage Pie even though I know it’s incorrect, lol. Just pinned this and I hope I get a chance to try it soon! 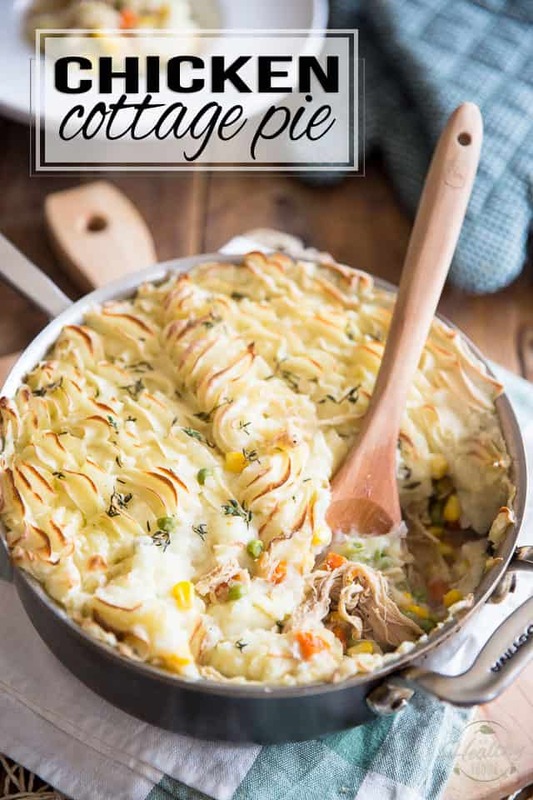 I made this last night, with a couple modifications that made me later realize I was making almost exactly my go-to “healthified” shepherd’s pie. I used sweet potato mash instead of white potatoes, and I added some whole wheat flour to the chicken & veggie mixture so it creamed up while holding together somewhat. So good! Sounds pretty tasty indeed, Erica! This looks great — except for the CORN!!!!!!! 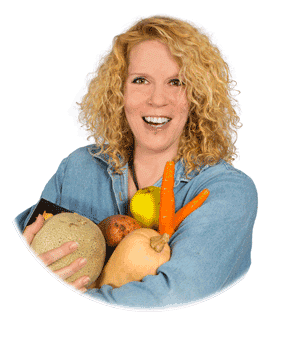 Please suggest another veggie to use instead of corn. I grew up having both shepherds and cottage pie. 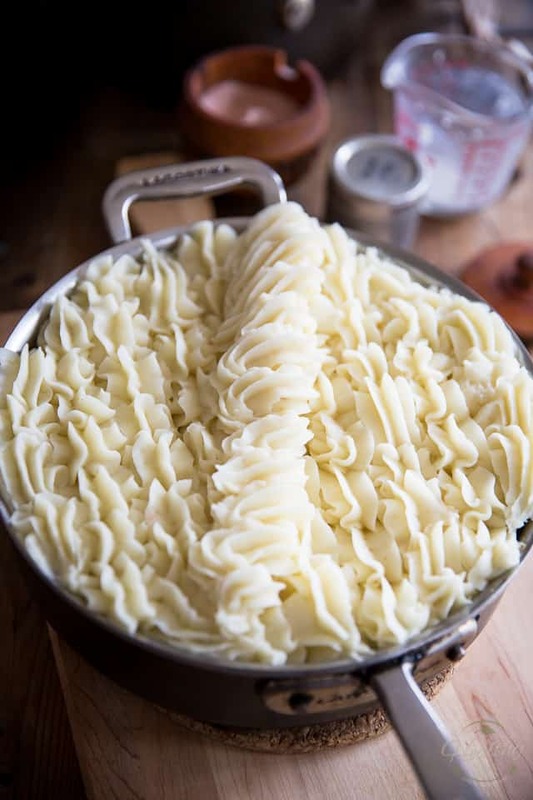 The difference being that shepherds pie used lamb or mutton while cottage pie used beef.